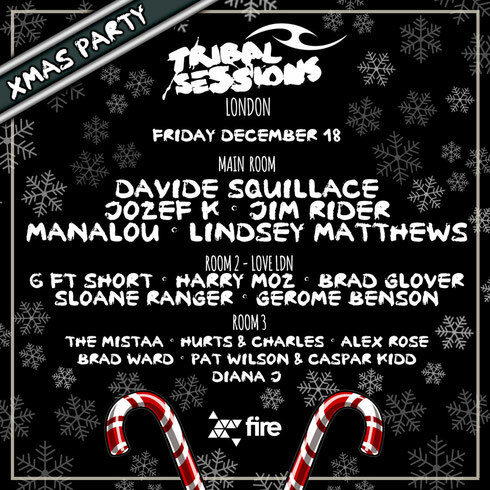 Tribal Sessions sees out the month this Friday, 18 December, with their closing show of 2015 at Fire in London, featuring Davide Squillace headlining. After a run of weekly Friday parties, the final show of 2015 will see Fire transformed into a winter wonderland with snow and ice themed production and decoration, snow cannons and painting for people who really want to get Tribal and festive. The Xmas Party at Tribal Sessions features Davide Squillace in Room 1; a regular at Circoloco, Womb, Berghain, D.Edge and many other clubs, Davide possibly stakes a claim as one of electronic music’s most prolific DJs, producers and remixers. With a no compromise work ethic, his sets and releases continue to place him at the fore of his respected scene. Jozef K, Jim Rider Manalou, Lindsey Matthews all support, whilst Love LDN host Room 2 with G FT Short Harry Moz, Brad Glover, Sloane Ranger and Gerome Benson. Room 3 features lots more talent on the decks, ushering in a festive finish for Tribal Sessions’ 2015 season at Fire.